Disclaimer: You are totally NOT allowed to sneak food into the movie theatre. But if you do, bring the good stuff and remember snacks packed in little containers are always fun and less messy than plastic wrap and baggies. Throw everything into a large bag or knapsack with a shmata covering everything for good measure. 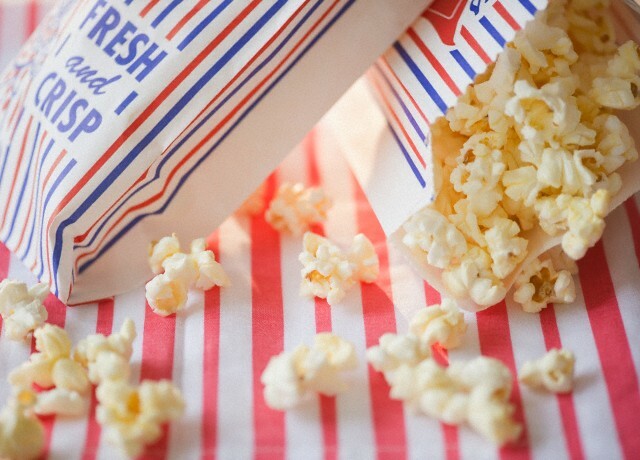 Here some movie nosh ideas. Make your own trail mix with 1/4 cup of dried fruit, 1/4 cup of unsalted mixed nuts, 1/4 cup of high fibre cereal like All Bran and a tablespoon of coconut flakes or dark chocolate slivers. This is a high calorie snack but it is filling and packed with fiber. If it’s a matinee you are heading out to see, why not pack a sandwich? Get creative and use fancy whole grain bread with a spread like hummus instead of mayonnaise. For the protein, use leftover meat or chicken or a hard cheese like cheddar. I caution you against a healthy tuna or egg salad sandwich since that would surely give you away. I can smell tuna from at least half kilometer. For the side, baby carrots work well so keep your crunching quiet. If you prefer traditional movie fair like popcorn then make your own. Ditch the convenient microwave bags for an air popper which you can pick up for about 20$ or try popping the corn in a paper bag in the microwave. Season it with homemade garlic butter. Use 2 teaspoons for 3 cups of popped popcorn. That is 2 servings of fat plus a serving of grains! Drink water as it is the preferred beverage. Don’t go with juice or pop. Who needs the extra calories? If you are a mindless eater maybe munching during a movie is not a good move. Chew sugarless gum instead. Finally, this may seem pretty obvious but you can’t beat a fruit or some cut up vegetables for a healthy snack. Add in some dairy like a yogurt or a piece of cheese and you’ve got the perfect snack. Who’s going to kick you out of your seat for eating something healthy? Posted on December 11, 2011 by montrealnutrition	This entry was posted in Health, Nutrition, Nutrition stuff and tagged healthy eating, Loblaws, McGill Dietetics and human nutrition, Montreal, montreal dietician, Montreal nutritionniste, nutrition, nutritionniste. Bookmark the permalink. ← Flavoured Milk for Kids? Are You Kidding Me?